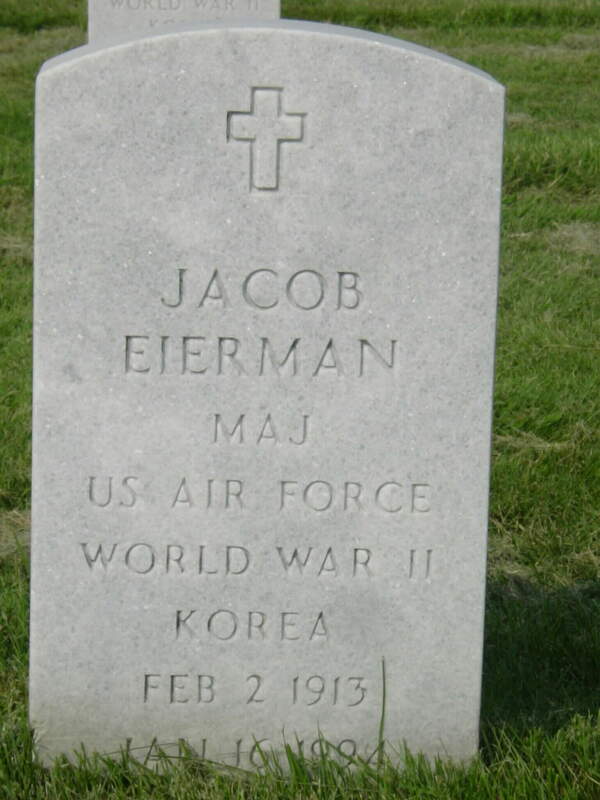 JACOB EIERMAN, Major, United States Air Force, February 2, 1913-January 16, 1994. Baltimore Maryland. Eierman enlisted on December 4, 1935 at Baltimore, Maryland and served at bases in New York, Hawaii, California and Illinois before joining the 89th Reconnaissance Squadron at McChord Field, Washington, in June, 1940. He was a member of the Doolittle Raiders of World War II who struck the first below against the Janpanese homelands. He was the Engineer for Crew Fourteen. After the Tokyo Raid, he was assigned to Anti-Submarine Wings on the East Coast until February, 1945. He qualified for Officer's Candidate School and was Commissioned a Second Lieutenant in June, 1945. his post-war assignments included service in Germany and Japan. He retired from the service on June 31, 1957. His military decorations include the Distinguished Flying Cross and the Chinese Army, Navy and Air Corps Medal,. Major Eierman and his wife, Marion, are buried in Section 64, Gravesite 588, Arlington National Cemetery.